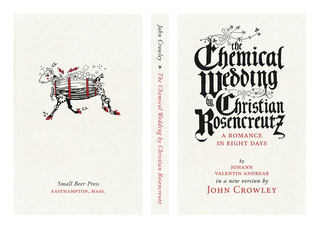 Many people point to Mary Shelly’s Frankenstein as the first science fiction novel, but Small Beer Press thinks that they’ve got one better: The Chemical Wedding by Christian Rosencreutz: A Romance in Eight Days by Johann Valentin Andreae in a New Version by John Crowley, written in 1616. This year marks the 400th anniversary of the novel’s original publication, and the publisher is kickstarting a new version. Johann Valentin Andreae was a German theologian who was a prominent member of the Protestant utopian movement. In 1616, he is believed to have anonymously written Chymische Hochzeit Christiani Rosencreutz anno 1459, which was published in Strasbourg as the Chymical Wedding of Christian Rosenkreutz in 1616. The story is an allegoric romance that follows Christian Rosenkreutz after he is invited to a wondrous castle for a wedding. “It’s not a tract, and I actually don’t think it’s an allegory. I think it’s a ‘Thrilling Wonder Tale’, taking the most extreme possibilities of the alchemy of the day and deploying them in a story as though they are actual happenings,” Crowley said. “Science fiction works the same way – [to] take the farthest-out science possibilities and embody them in stories. The Kickstarter for this project has already met its goal, and closes later this week. While they will be publishing a trade paperback edition of the novel this fall, backers can essentially order a limited hardcover edition through the project.